“Alright class, settle down!” boomed Chris Walsh, my 9th grade science teacher. As the high school freshmen entered the classroom, the first thing each student did was dart to the right side of the blackboard to look at the day’s agenda. Each morning, Mr. Walsh would write the objective for the day, the specific topics the class would be covering, and that evening’s homework assignment. I headed to my desk, confident I could attack the day’s challenging astronomy curriculum because I knew what to expect. 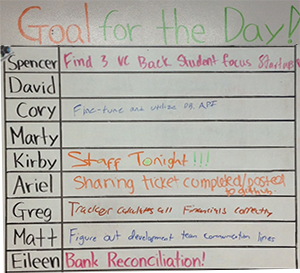 The daily agenda was one of the most effective strategies I saw a teacher use because it kept the entire class on the same page. Everyone knew what was going on and what was expected of them. Both the teacher and students were held accountable for accomplishing the clear task outlined on the blackboard. As I thought about ways to use this strategy for my team at influencers@, we ended up trying a new idea deemed One Goal a Day. With the help of Eileen Han and Devon Grodkiewicz, we drew a big chart on the whiteboard next to the door with every team member’s name on it. Next to each name is a spot to write one goal that they want to accomplish each day. As everyone walks into HQ, they go to the chart and write one concrete goal that they want to accomplish by end of day. What is so great about this system? Occasionally, we will get to the end of a day and think to ourselves, “What the heck did we accomplish today?” Writing a goal keeps us on track with a clear path towards exactly what we need to complete. When we proclaim publicly on the One Goal a Day chart that we are going to accomplish something, the rest of the team now knows about it. That social pressure holds us accountable to ensure the task is completed. Since writing the goal is the first thing that we do in the morning, it forces us to think about how the business day is going to be a great one before arriving at the office. This way, people are already coming in with a mission, ready to attack it. What kind of tactics do you use to keep people in your organization on track, organized and accountable?